Hockey quotes for coaches, players, parents and fans. Looking for some motivation for your team? Inspirational hockey quotes are great to motivate athletes and energize a fan base. Sometimes you do the hard work and set the table and somebody else eats the meal. Street hockey is great for kids. It’s energetic, competitive, and skillful. And best of all it keeps them off the street. Hockey players wear numbers because you can’t always identify the body with dental records. A fast body-contact game played by men with clubs in their hands and knives laced to their feet. High sticking, tripping, slashing, spearing, charging, hooking, fighting, unsportsmanlike conduct, interference, roughing — everything else is just figure skating. A puck is a hard rubber disc that hockey players strike when they can’t hit one another. The quoted authors above in this section knew a thing or two about playing the game. We get nose jobs all the time in the NHL, and we don’t even have to go to the hospital. Playing goal is like being shot at. Hockey belongs to the Cartoon Network, where a person can be pancaked by an ACME anvil, then expanded – accordion-style – back to full stature, without any lasting side effect. Please send us any ideas you have for additional suggestions for our listings. Thanks. 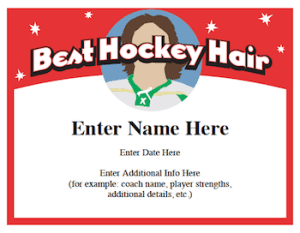 When any hockey certificates collection be complete without a “Hockey Hair Award”?